In the information age it becomes paramount to get your message to as many people as possible in an efficient and timely manner. Basically: what we do, what we have, where we are, when we’re here, and, for that matter, why we’re here, etc. Blow our own horn a little (or a lot). One gets used to hyperbole when surfing violin shop sites, and why not? No one is going to spend time and effort on self deprecation. However, I’m not comfortable trying to pass myself off as the next incarnation of Antonio Stradivari. On the other hand, we’re good at what we do here, and we have a long list of satisfied clients who think so too. Also, a little humor goes a long way, so don’t expect the usual stiff snooty boilerplate that one usually finds on the subject of the violin. Here are a few of the typical questions that I hear throughout the year, and some realistic answers. What price range instruments and bows do you sell? Our entry-level outfits range from $325 for small violins to $1650 for full sized cellos. Individual student to advanced instruments in full size are priced from $400 to $4000 for violins, $550 to $5000 for violas, and $1200 to $10,000 for cellos. Older instruments often (well, always) require structural, cosmetic, and tonal restoration. If we are to sell vintage instruments and stand behind them, they must meet very high standards of condition and quality of sound. In other words, they’re not cheap. Most quality vintage violins and violas are found above $2500. Cellos start around $5000. And yes, these are still “student” instruments, but they are in great demand for their superior sound and the quality of the wood and varnish. In the lower price ranges, new instruments tend to be a better value—all that repair and restoration does not have to be built into the price. Because of the shortage of good wood and the advancement of technology, the best lower-priced bows (< $200) are of synthetic material (the sticks, not the hair). Fiberglass and carbon fiber have revolutionized the student bow market. Brazilwood, once the common material of inexpensive bows, is being replaced with these materials (and it can’t happen too soon). We have fiberglass and carbon fiber bows from $45 to $450. Pernambuco (a generic term for caesalpinia enhinata and other hardwoods) is the wood of choice for better bows, and we prefer the bows made in Brazil where the wood comes from. We can be sure that the wood is legally obtained and properly seasoned. Brazilian-made bows are priced from $325 to $1000. This price range also encompasses higher level carbon fiber bows. Quality vintage bows are priced from $600 up. Current international law prohibits the export of Pernambuco from Brazil in any form but a finished product. And don’t get me started on all this recent nonsense about ivory. Michael Hattala, who does all the bow rehairing and restoration, makes bows for the professional priced at $4500.00. He is a member of the American Federation of Violin and Bow Makers. Click for photos of one of his viola bows. So what is the difference between an entry-level, a student, and a professional instrument? Entry level instruments tend to be inexpensive, as they are for beginners. They are made in large workshops by many hands, and, depending on what part of the world they come from, they are often made of pre-carved or pre-assembled parts; and usually the wood is plain looking and the varnish monochromatic and shiny. There is no excuse, however, for them to be badly made or cheap looking; and they should always be set up properly. Professional instruments are those that are of a quality that would be acceptable to a professional musician; and this usually means a musician in an orchestra or a soloist. They are typically made and varnished by an individual maker. Professionals, more than anyone else, are more likely to own either fine vintage instruments, or new products of today’s best makers. Prices for these instruments seldom get below $15,000, and if you read the papers you’ll know how high they go. The best vintage instruments are so expensive simply because there are x number of them left and x² number of musicians and collectors who wish to obtain them. (x²\x=$$$$$) The great Italian violins like Stradivari, Guarneri, Bergonzi, Guadagnini, and Amati, etc. are rapidly being repriced as works of art rather than as the tools of the musician. They’re soooo big, and they take up so much space that we stopped working on or selling basses 22 years ago. My aching back probably contributed to that decision. See our links area for suggestions on where to obtain basses and repair. Why do you sell instruments made in China? Aren’t they guilty of human rights abuses? Wherever violins have been made in the last few hundred years there have been human rights abuses. Chinese instruments are not made in slave labor camps or in prisons. We may not like their political system or their leaders, but those institutions have little to do with the relatively small violin making industry which is run by individual entrepreneurs. Violin shops, in general, only sell Chinese instruments from the top 2% to 5% of what is made over there. The majority of student instruments made in China are low priced junk, but it’s that top 5% that rivals anything made in Europe, but at a far lower price. I sell instruments made in China for the same reason I choose instruments from any other source—quality. And they listen—if we don’t like something or if we suggest an improvement, they actually pay attention. Let’s be honest—fair labor costs in China are low; and they have a good wood supply. I choose only the best makers, and remember, the Chinese were making fine furniture while the Germanic tribes were still piling stones. Can I order instruments online? I am not set up for online ordering. I firmly believe in personal contact. I have a toll-free number. If you call, I’ll be the one answering. It’s a lot easier than email. I know what I have in stock because I can walk out to the showroom and look. And I can ask the right questions so as to have an idea of what you are looking for; and I can clear up any misconceptions you have about what this (the “violin” business) is all about. Will you ship instruments or bows on approval? I am happy to do this after I have had a conversation with you about what your needs are. Approval is ten days. I pay the shipping to you, you pay the shipping back, and the insurance is on me. If you purchase an instrument, I’ll reimburse the return shipping on the remaining instrument(s). 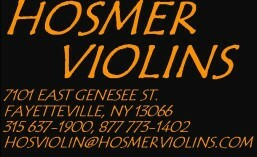 An advanced level instrument from Hosmer Violins will be valued at 75% to 100% of the purchase price, as long as it has been properly cared for. Entry level instruments traded for the next size of the essentially same instrument are valued at 75%. Entry level instruments are valued at 100% when traded for substantially higher-priced instruments. Again, proper care is paramount to retain value. Bows are another story. Entry level bows are often priced below the price of rehairing, and wear and tear weighs heavily on the value of bows priced under $200. Often it is prudent to keep a student bow as a spare rather than to trade. Cases are graded on condition. Instruments obtained from other establishments are compared to similar instruments that we sell and are valued accordingly. Whether they have been properly set up will have a lot to do with it. I am sorry, but we cannot accept trade-in’s of instruments that we would not normally sell. No rental grade instruments, no EBay junk, no basket cases. I don’t do trade-ins the way car dealerships do—inflate the price of the new vehicle and give an artificial value to the trade in. If it’s not an instrument I would stand behind, I won’t take it. I am always interested in buying higher quality vintage instruments, especially those from Markneukirchen before WWII. What I will offer depends upon the overall quality of the wood, varnish, and workmanship, and, of course, the condition. I am not interested in the typical entry-level European and Japanese instruments of 30 years ago, which were usually sold by general music stores and band/orchestra suppliers. They tend to be oversize, overweight, and coated with ugly varnish that has by now become scratched and dull. These are the instruments that have become totally outclassed by the modern Chinese product. If you are selling a valuable professional-grade instrument that is beyond the scope of this shop, I will be happy to offer my advice as to whom to contact, etc. I made the decision many years ago to concentrate on sales rather than rentals, providing well-adjusted student instruments at reasonable prices. Doing rentals properly takes a great personal and financial commitment. Other people in this business tell me that rentals are a goldmine—that it’s a great way to generate sales, etc., etc. Rental is a good idea for beginners—just don’t rent forever, and when you decide to buy an instrument do it from an established violin shop. I am sorry, but sheet music is not my area of expertise, and this shop is too small for a sheet music display. There are other local establishments that carry sheet music, and there’s always the internet. Since the appearance of the tablet, sheet music’s days are numbered. How about cases and other accessories? Do you sell them at a discount? Read the list under our product lines. We can’t carry everything, but you’ll find that we can accommodate most of your needs. It seems that a new shoulder rest and a new line of strings appear every month, and there must be a contest to see how expensive they can get. We offer string and accessory prices at 25% to 35% off list. Sure, you can buy from internet sites for less, but they won’t put the strings on for you, lubricate your pegs, and check your instrument over at no extra charge. If you are experienced in violin maintenance, by all means go for the best price. I have decided to carry only cases that I know are of high quality. I tried to carry some less expensive stuff to save customers money on entry-level outfits , but in every instance the products came back to bite me. The handles broke, the bow holders broke, the zippers broke—whose fault was this? As far as the buyers were concerned, it was mine. That’s how it works in this business. So now I only carry Bobelock (made in Philippines), Core (made in China), BAM (made by those Frenchies, not Emeril Lagasse), and the “Cocoon” cello case. I have made one exception to this: to keep the price of small size outfits reasonable I have found a foam case I can live with. There is no doubt that the myriad other Chinese case makers will some day wake up and straighten out their products, but I can’t wait. Prices are competitive with what you will find online. Can you give me a repair estimate over the phone? Can a doctor diagnose a heart problem over the phone? (Actually, if you are hooked up to an EKG machine and the doctor is online—oh, forget it) Please don’t think I’m trying to weasel out of quoting prices, but I simply can’t quote repair prices unless I have the instrument in my hand. Every violin is different, as is every viola and cello; and the bigger the instrument gets, the bigger and more diverse the problems become. For instance, if I am asked to quote the price for a new bridge, I need to know if the neck angle is correct, whether the soundpost fits, and whether the fingerboard is rutted or the neck badly warped. I’m not a clairvoyant. Bring it in. Michael Hattala is in charge of bow rehairing and restoration. He is a talented bow maker, and he spends much of his time in his own shop making bows; his restoration skills are impeccable. We use the finest horsehair obtainable. I got a violin on EBay real cheap. Can you make it work? And the conversation deteriorates from there. Usually the purchase price was $50 to $100. I suggest that they bring the instrument into the shop so I can see it, but generally it will cost at least $200 to make it functional. There is silence or gasps on the phone. Every once in a while someone comes in with an EBay special that’s not bad, but usually it’s a cheap Shanghai violin with bad pegs, worse fingerboard, useless strings and bridge, warped bow and foam case the quality of a $3 beer cooler. My next suggestion is that they return it, and that always goes well. If there is a chance that the finished instrument will have a value considerably more than what I charge to do a proper setup, I’ll work on it. My unfortunate experience has been that after I have done a couple of hundred bucks worth of setup on one of these low quality VSO’s (Violin Shaped Objects), what you wind up with is a well adjusted but bad sounding piece of junk made from materials that I can’t trust not to warp or crack at the next change of seasons. So, to make a short answer to your question—probably not.